There are several other types of surveillance devices, including motion sensors and trip sensors. There are even rumors of smell sensors, which are supposed to be able to distinguish between humans and animals. For more information on road sensors used around Area 51 and lots of pictures of their internals click here, and here for the new sensors. 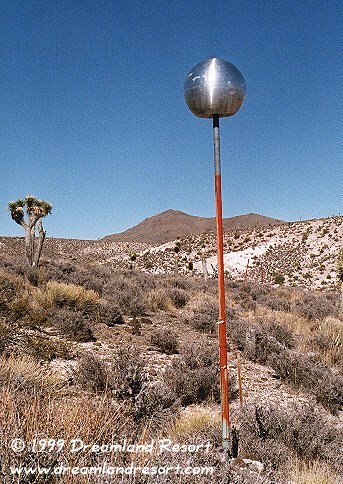 Contrary to some rumors, the silver balls like this one that sit on top of some of the orange posts marking the border are no surveillance devices. We have examined several of them, and found no evidence that they are anything other than hollow aluminum balls. The balls are originally dropped from planes for radar calibration, and apparently some are being reused to make it easier to spot the border. The orange posts alone are sometimes hard to see, especially from the air, and the shiny silverish balls help a lot. This particular photo was taken just north of Cammo Hill and Groom Lake Road, facing north towards Bald Mountain. If you look closely you can see two more orange posts in front of the light colored ridge. 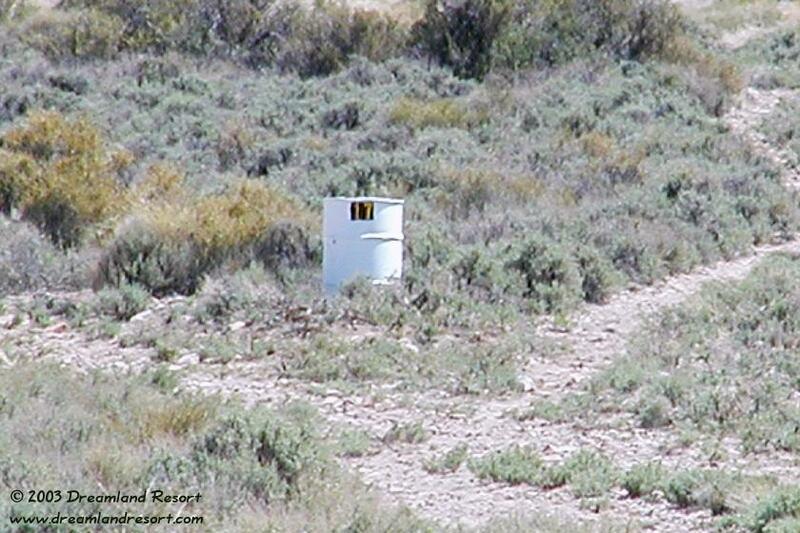 There are many white barrels like this one (#17) near roads and intersections within the restricted area around Area 51. They are used as markers for contractors and other traffic not completely familiar with the area to identify the sector that they are in. We are told that sometimes vehicles that move around in the restricted area are being called to identify their current location, or to confirm that a tripped sensor in a particular sector was actually tripped by them.